Owners of foosball tables, who are very active players, sometimes find it difficult to get foosball table parts and accessories for their table. Knowing where to access these parts will enable foosball enthusiasts the chance to continue enjoying the game. On-line shopping is always an option as you are able to see what is being offered while you browse sites. You can compare prices as well as make purchases easily and not have to make the journey outdoors to shop. Continuous and vigorous activity on playing foosball can wear parts and it is important for owners of tables to replace these parts quickly. Playing the game with faulty parts will not only damage your table but also lower the quality game you will experience. Here are some foosball table parts that may need replacement over time. Some foosball ball manufacturers will give you the advantage of choice in their packaging of these balls. 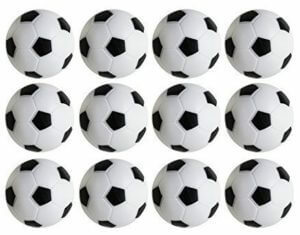 Packages are available with as many as 11 different foosballs to try; with this package, you are able to decide what is most comfortable to you for play. The original foosball men that come with your foosball table may not be the type of players you want to use. You have the option to replace them. Professional foosball players have certified and recommended playing men with pointed toes and have what is called cross-hatching on the feet. These features are designed to allow players to have better ball control. Like playing real Soccer, the football players have the advantage of catching the ball with their feet and holding it stationary in order to determine who to play the ball to, this is also attainable with this specific feature in the playing men. Contrasting, are the original playing men made with rounded feet, which are not able to achieve these kinds of specific play. They are limited in making precise shots as well as bank shots. Replacing foosball rods can be very expensive; especially if it is on a high-end table. Many manufacturers are not trustworthy with the quality rods they make, as they will try to cut corners. 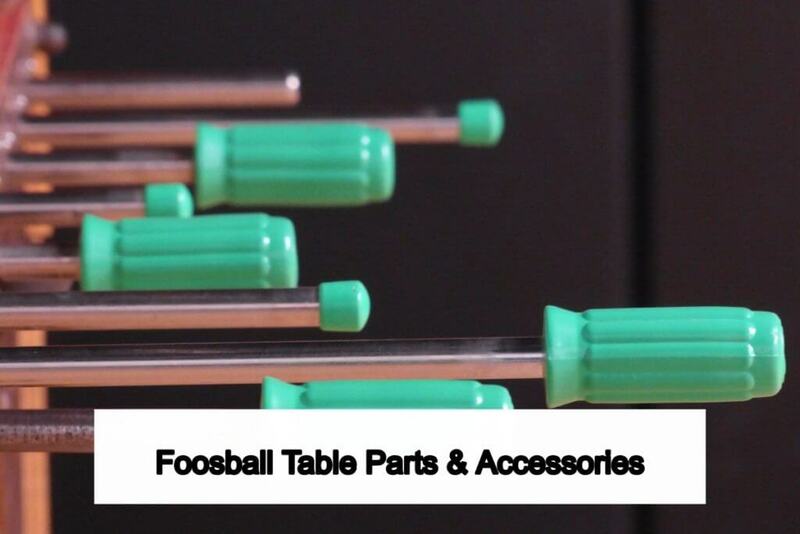 It is important foosball table owners know what to look for in purchasing replacement rods. Some rods are made with heavy materials that hinder players from making intricate maneuvers. Their playing tactics, as well as their overall performance with the execution of skills, are greatly hindered by these heavier rods. Lighter rods are made with hollow interiors and this helps players move a lot quicker while being able to make moves with precise and perfect ball control. They are able to slide the rods easier and with less cumbersome effort in comparison to the heavier foosball rods. Good rods are also manufactured with rubber handles on the ends that are protected for children who may be present during play. It helps to protect them in the event of being hit especially in the head during play. The rubber handles may also be a way for manufacturers to hide the fact that their foosball rods are not hollow; so it is very important to examine rods before purchasing. If purchases are being done online ask the supplier before making your purchase. Foosball Rod Bumpers are very important for protecting the sides of your foosball table. During play, if there are no rubber bumpers the sides of the table can be easily damaged, especially if you are a rough player and very enthusiastic. Bumpers will wear over time and will flake and dry out if foosball table owners do not use the right lubricant. It is advised to use silicone and not WD-40. WD-40 will damage the rubber and shorten the life of your bumpers. Foosball table manufacturers are the expert at ensuring you have quality parts for your table. If it is a high-end table you are sure to get what you pay for. 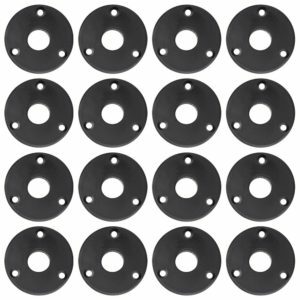 Many replacement parts for foosball bearings can be tricky to buy, as you would think if it is not the brand for your table you will still get the same performance as the brand part; well, this is not the case. Buying the wrong bearing for your foosball table will have you not get the smooth gliding motion you generally experience with the original foosball bearings you had. It can significantly throw you off your game. Cutting costs in this area is not advised. Foosball table leg levelers are not really a replacement part. Most if not all high-end tables costing over $400 are manufactured with them. A cheaper foosball table may require the adding of the parts and you may want to buy a set for the purpose. They will require some expert knowledge to attach them to your table, but it will be worth the effort and cost. Leg levelers are essential for any foosball table. Beginners at playing foosball find it rather difficult to master the game if they are not able to control the ball and prevent it from rolling all over the playing surface. Leveling the table will help in this regard; so the installation of foosball leg levelers is what is needed to correct this issue. The scoring device on your foosball table is very important, unfortunately, in my opinion, they are too flimsy. The kind of beating these little beads or plastic runners get during play is incredible, especially if players are really spirited and enthusiastic. Replacement of these items may not be expensive, but maybe if they were made with a sturdier material they would not wear so quickly. The scoring devices may be had in sets of 5 or 10 depending on what your needs are. Installation of the correct lighting system for your foosball table is very important. You need to be able to see where the ball is at all times so your playing men can be positioned accordingly. There are many different manufacturers of foosball table lighting systems to choose from. They can be a bit pricey, so you need to determine a budget when making the decision to purchase. On-line stores are there to give you an array of choices so you can determine which is better suited for your lighting needs. Revolutionary and on the market is the new Aurora Foosball Table with LED lighting, fitted along the inner side gutter around the playing field. It enhances your vision even when playing in low glow lights or in the dark. Many foosball manufacturers place some cup holder along the sides of the foosball table. This may be a unique addition to the table, but it can be a dangerous accessory to have. Vigorous playing will cause liquids to spill on the playing surface, and this is not good. It will damage the surface especially if it is not cleaned off immediately. The liquid will soak under the material on the surface and really cause some unsightly warps, soften the material as well as leave water marks on the surface. Replacing these cup holders by using a small table to the side, while playing, is definitely the safest way to go. If you rather have the cup holders attached to the foosball table, then you may consider replacing the manufactured ones with inset cup holders. These will ensure the beer bottles are sturdily kept during play; hence, no spills! Wrapping the handles of your rods is helpful during lengthy plays. Your palms will become sweaty and the wraps will help with your grip. There are many different types of wraps and choosing the right one is dependent on what feels more comfortable to you. Replacing wraps are easy, as you can source them online. Some players opt for the Tennis handle wraps, as they find they get a better grip on them. Rod handles are also replaceable, as many persons find the wooden handles easier to grip and enable good hand coordination during play. Some foosball table owners opt to change the original handles for wooden ones because of this. Replacing pins can be had in sets of 15 pins and one punch, as well as you are able to get a single pin if you have only damaged one pin during play. Replacing your foosball men over time, it is recommended you use new pins as the old ones may become misaligned after long uses. You need to have the precise coordination of your playing men, so choose wisely when time comes to replace your pins as well as your playing men. Whether you are a professional foosball player or you just love the game and enjoy entertaining with friends and family, having a well-maintained foosball table is very important. Periodic assessment of your foosball table parts and making pertinent replacements will ensure a longer lifespan of the table. You, your family and friends will have more time to enjoy playing the game you all love. There are many types and kinds of foosball table cover. High-end tables which cost quite a bit is generally more expensive to find replacement parts. Manufacturers of high-end tables will supply purchasers with replacement table parts as a general practice. Over time, these replacement parts will wear and the need to replace these parts when it arises, contacting the manufacturer is the smartest decision as they will have these parts readily available. Some sporting goods stores may have genuine parts as the replacement for what is needed, but the chances of really getting genuine foosball table parts are always from the manufacturer. Experience foosball players will have the advantage over a new player to foosball, as they will have experience in purchasing replacement parts as needed from their local sporting goods store. You may want to get some advice and guidance from these more experienced players and owners of foosball tables as the challenge is, recognizing high-end parts from the non-genuine. Amazon, Target, Walmart are one of the best online stores which guarantee supplies of genuine replacement parts for any foosball table.